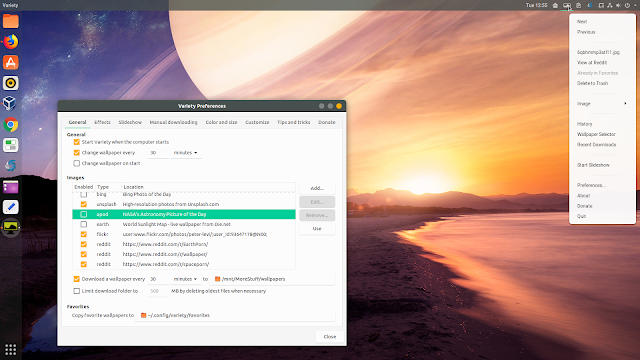 A new major version of Variety Wallpaper Changer is out. With the latest 0.7.0 release, Variety was ported to Python 3, while also receiving some improvements like support for setting the Gnome Screensaver / GDM background to match the desktop wallpaper. Variety is a wallpaper changer and downloader for Linux. The application use local images or download wallpapers from online sources like Unslpash, Bing Photo of the Day, Desktoppr.co, NASA's Astronomy Picture of the Day, and Flickr, and it can also set your wallpaper to a live earth sunlight map (from Die.net). More sources can be added, like Reddit (allows adding as many subreddits as you want), Wallhaven.cc, or media RSS feed. The application lets you specify the interval at which it should download a new wallpaper and the wallpaper change interval. Other features includes image filters that can be automatically applied to wallpapers, quotes from Goodreads, QuotesDaddy, TheQuotationspage.com or local text files (with options for appearance, placement and when to change it), and it can also display a digital clock on the desktop, displaying the current time and date. If you're an Ubuntu 18.04 / Linux Mint 19 user, which has Variety 0.6.7 in the repositories, there are quite a few other changes between the version you're using and the latest release, including the removal of the VRTY.org functionality (ratings, sync, safe mode, etc.) which no longer works, get_wallpaper support for KDE Plasma 5, fixed trash deletion, Unsplash API update, and fixed LXDE support. Variety can be managed from its tray icon, which allows skipping to the next or going to the previous wallpaper, add image to favorites or move it to the trash, show a wallpaper history or show recently downloaded wallpapers. As a result, it's best to use Variety with a tray / appindicator. If that's not possible, you can access some of these features by right clicking on the variety icon in your taskbar. Those using other Linux distributions can check out the Variety installation instructions from here. The source is available on GitHub.